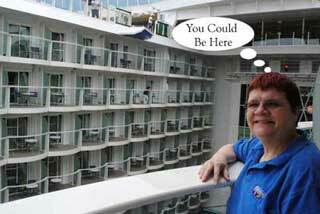 Close your eyes and picture yourself on the balcony of your favorite cruise ship. It is almost dusk. Memories of the day's activities are running through your mind. You open your eyes just in time to witness the sun slowly sinking from the sky and settling into it's nightly resting place deep in the ocean. Darkness surrounds you as the sun's light is completely extinguished. This doesn't bother you since you have hope that tomorrow the sun will once again rise high into the sky above and shine brightly as you explore yet another destination along life's journey. As 2008 draws to a close, I would be remiss if this column didn't take a look at the year in review. Somewhere out there, someone stood on a balcony looking at the final sunset of the year and just as you, hoped for a bright tomorrow. Perhaps this year, more than others in recent time, many people are hoping for a brighter tomorrow. The last quarter of the year has been the most challenging as we learned that we were indeed in a recession. Close your eyes one more time and think about the good and the bad times of 2008. On the bad side, I suspect your list will include the rising cost of fuel, the credit crunch, the housing problems, bank bailouts (and more bailouts)... On the good side there are the new leaders that were elected that bring the promise of change to the new year. The task of digging out of the recession is in their hands. The cruise industry was not exempt from the credit crunch and rising fuel costs. 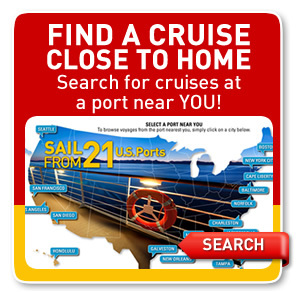 All the major cruise lines imposed fuel surcharges which added to the cost of your vacations. The good news is that the end of the year brought declining fuel costs and the cruise lines have rolled back those surcharges. Already the sun is starting to peak out from it's nightly resting place. 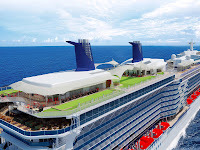 Amidst all of this, Celebrity Cruises new ship Solstice set sail for it's inaugural season. 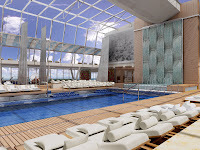 I was fortunate to be one of the first passengers to set sail on this new ship which has set a higher standard for all the cruise lines to meet. We'll take a closer look at this ship in future columns. What are your happy memories from 2008? I hope that you were on a cruise vacation. 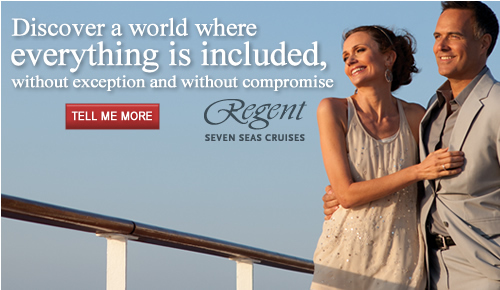 I also hope that the economic woes of 2008 haven't prevented you from planning future cruise vacations. For those of you thar are regular readers of my blog, you know that we visisted Bermuda, Alaska, and the Galapagos this year. Due to the holidays I've gotten behind on my blogging, but promise to continue the Galapagos trip column in January. In bad times, investors seek out value. 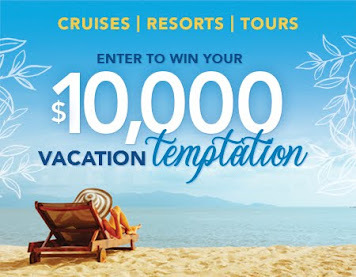 Cruise vacations continue to be the best travel value, so this is the time to take advantage of the bargains that are available. The events of the morning of day 7 changed my afternoon plans. We had a wet landing for our morning excursion. I wore my Teva shoes which worked out well for the excursion. When leaving the island, the waves were preventing the Zodiac from getting completly to the beach, so we had to wade out a bit to get back in. I decided to keep my Teva shoes off. When we returned to the ship, I still had my shoes off and didn't think much about it. Unfortunately, while disembarking, my foot slipped and I managed to stub my toe. I didn't break it or anything but it was sore. I didn't think it would be a good idea to go hiking any distance with the sore toe, so I decided to change to the low intensity activity instead. The low intensity activity consisted of a Zodiac ride along a channel betweeen Isabela and Fernandina islands. We saw flightless cormorants, green sea turtles, sea lions, and iguanas. I was enjoying myself despite my sore toe. What happened next would become the highlight of the day. One of the naturalists spotted Orca whales and announced it on the radios. Even on land the groups were aware that Mother Nature had blessed us with a special treat. Just a few feet from our Zodiac there was an Orca whale breaching the surface. We started to follow nearby, staying just far enough away not to invade its privacy. 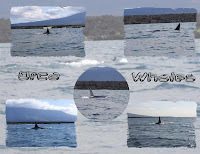 Before we knew it, there was a pod of 4 whales in the area giving us quite a show. It was a pleasant surprise to see Orca whales just a few feet from our Zodiac. All of us, including the naturalist, got some amazing pictures. The most amazing picture was when one of the whales had a sea turle in its mouth. This was definitely a rare occassion. In fact, rarely are Orcas seen in this area. I obviously can't say that you'll see Orcas if you go to Galapagos, but no matter what Mother Nature has in store for you during your visit, I can say you will cherish that for the rest of your life. I have many memories from this day and from the entire trip. 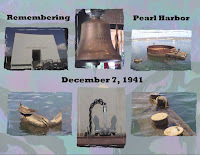 Sixty-seven years ago today, at precisely the moment that I started this column, the United States was drawn into World War II when Pearl Harbor was attacked. While this was before I was born, it is still a date that is impossible for me to forget. 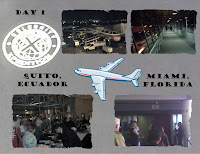 These pictures were taken during a visit to the U.S.S. Arizona Memorial during a cruise vacation to Hawaii. These images remain in my mind several years after our visit. We were so moved by our visit, we went back the next day for a second visit. As we mark this anniversary, let us not forget the many troops, past and present, that have dedicated themselves to keeping us safe. We especially remember those that gave the ultimate sacrifice. While lying in my bed this morning, I was thinking about iguanas, blue-footed boobies, Galapagos turtles, and penquins. 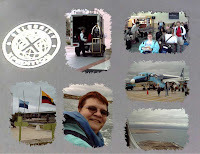 My mind wandered to Celebrity Solstice and the game of crochet we played on the upper deck. These were just a few of the great memories that were running through my head. It was very peaceful and quiet. All of a sudden the quiet was interrupted with the sound of heavy machinery working outside. What could that be, I wondered. Then it dawned on me. 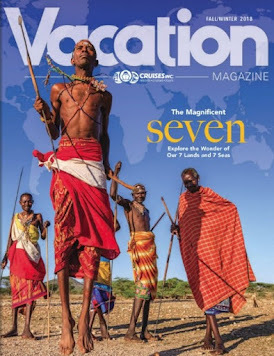 I was no longer on a ship in Galapagos, or on Celebrity Solstice, but I was back to reality in my own bedroom. I recalled watching the news and weather forecast last night which called for 1-3 inches of snow. 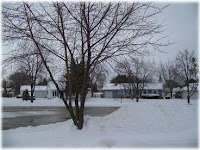 Indeed the weatherman was correct and the grass, sidewalks, and streets were now covered in a new blanket of snow. In its untouched state, I have to admit the snow does look nice, but I'd much rather look out of my window and sea a sandy beach. Perhaps many of you that are reading this today have had a similar experience. For those that are in warm climates, enjoy your warm temperatures and pleasant views. Call to action -- the rest of you know what you need to do. It's time to plan your escape on a cruise ship. Right now is a good time to plan for your winter getaway if you haven't done so already. 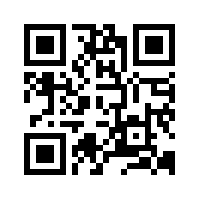 You can use the links on the right of my column to start your planning. I know you are probably thinking the economy isn't good. Every day you read depressing stories in the newspaper. I'm happy to report that there was some good news in the papers yesterday that you may have missed. Carnival, NCL, Disney, and Royal Caribbean all announced a suspension of fuel surcharges for their 2009 sailings. This applies to existing and future bookings. 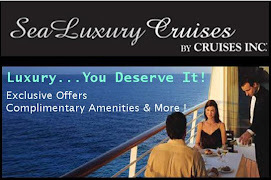 Refunds or onboard credits will be issued as indicated by each cruise line. The press releases also indicated the critieria when surcharges could reappear. But for now, they are gone which is good news for those that want to get away from the winter weather. I know that I have plenty of things to be thankful for, including my health, family, and friends and the ability to share my love of cruising with all of you. I’m grateful that I’ve been able to explore new worlds with family and friends again this year. 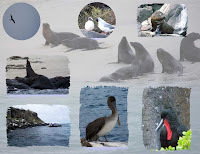 The highlight of the year was our cruise to the Galapagos aboard Celebrity Xpedition where we got to see the magnificent widlife and scenery of the Archipelago. 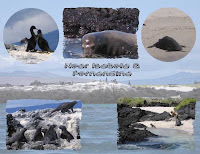 Highlights included Blue-footed Boobies, Flightless Cormorants, Frigate Birds, Galapagos Penguins, Sea Lions, Galapagos Turtles, Land and Marine Iguanas, and Sally Light-foot Crabs. What a wonderful world that has been created for us to explore. As I started to write this article, I couldn’t help but think about the innovative and brave explorers who ventured into the unknown seas in search of a New World. Without those first ship-builders, captains, and crews, who passed their knowledge down from generation to generation, I suspect I wouldn’t be writing to you about our recent voyages. Our cruise to Bermuda was another highlight of this year. 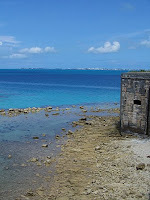 We sailed from New York to Kings Wharf, Bermuda where we docked for two days. 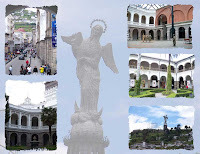 This is a small country which can be explored by public transportation including bus and ferry. Once again, you can't help but think about the early explorers, especially when visiting the Dockyards or Fort Hamilton. I can only imagine what it would be like sailing the open seas without knowing where you were going or what you would find when you arrived at your destination. I am thankful to those explorers that made it possible for us to journey to far away places. Another highlight of this year was a pre-inaugural cruise that I took on Celebrity Solstice, their newest and most magnificent ship yet. Those early pilgrims sailed the oceans in ships that were made of wood, not steel like those of today. They had no engines to speed them along, but instead had to rely on the wind to guide them to their unknown destinations. The Solstice, complete with all the latest navigation technology, makes the job of the Captain quite easy. The early explorers had their sextants and crude charts which might have been enhanced by information from previous voyages. The final highlight from this year was an Inside Passage Cruise to Alaska. I've not processed our pictures from there yet, but when I do, this will be another cruise I'll share with you. Imagine the explorers sailing into the unknown waters of Alaska with icebergs surrounding their ship. Today, modern technology keeps the vessel safe as it gently pushes the icebergs away as we journey closer to the glacier that lies ahead. Day 6 (Wednesday, Sept. 3rd) continued with our afternoon activity. This day turned out to be be one I was waiting for all my life. It was the day that I saw penguins in the wild for the first time. I love penguins, but up until now, I'd only seen them in captivity or on the television or movie screen. Bartolomé Island (Spanish: Isla Bartolomé) is a volcanic islet in the Galápagos Islands just off Isla San Salvador’s Sullivan Bay coast. 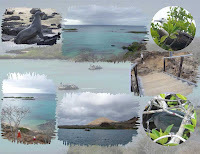 The tiny islet of Isla Bartolome is among the younger of the Galapagos Islands. With a total land area of just 1.2 sq km, this island offers some of the most beautiful landscapes in the archipelago. One of the most famous landmarks in the Galapagos can also be found here, Pinnacle Rock, which is among the most frequently photographed vistas of this volcanic island chain. Shown recently in the Hollywood movie ‘Master & Commander’, this towering rock face is actually an eroded lava formation. Formed when magma was expelled from an underwater volcano; the sea cooled the hot lava, which then exploded, only to come together and form this huge rock made up of many thin layers of basalt. Pinnacle Rock is considered to be the emblem of the Galapagos to many, and is one of the most recognizable sites here. Tourists can get off on the island opposite Pinnacle Rock and then proceed to climb a 600m trail to Isla Bartolome’s 114m high summit. From here one is treated to some truly stunning views of Sullivan Bay, Isla San Salvador (Santiago), Pinnacle Rock and Islas Daphne. Though a pretty desolate island with mostly dried shrubbery like candelabra cacti and a few lava lizards running about, what makes this island so special besides Pinnacle Rock is the fact that out here, one can spot the ever playful Galapagos Penguins, which are the second smallest penguin species in the world. They are the only penguin to cross the Northern Hemisphere which means they live more north than any other warm weather penguin. Found near Pinnacle Rock’s shore or swimming in the waters around the Rock, these penguins are a joy to watch as they can be found nowhere else on earth, especially in such warm climates. 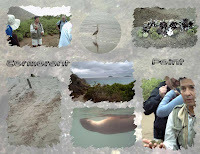 Our afternoon activity was a Zodiac ride along the coast searching for penguins and enjoying the geological formations. We saw several penguins on shore and playing in the water just a short distance away from our Zodiac. After cruising along the coast we made a wet landing on the beach. We proceeded to cross the Isthmus that separates the two beaches found on Bartolomé. The Blue-Footed Boobies were diving for food on the other side of the beach. It was an amazing site to watch them dive into the water. Following the hike, we had time for swimming and snorkeling with the penguins, sea lions, and tropical fish. So far, this was the best day of our cruise yet. 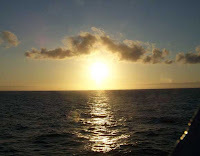 Day 6 (Wed. Sept 3rd) dawns and we are at the mid-point of our Galapagos cruise. We've seen sea lions, iguanas, blue-footed boobies, cormorants, and many other species of birds and local wildlife. We now turn our attention to the sea to get a closer look at the aquatic life. 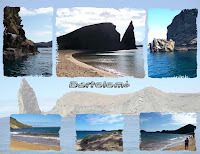 Bachas Beach is a beautiful beach located on the northern coast of Santa Cruz Island. The name "Las Bachas" comes from the poor English pronunciation of "barges". During the 1950's the WWII barges had broken their moorings and ran aground on the beach. The morning activity that we chose was a wet landing on Bachas Beach. After a short hike, we had time to snorkel. Pacific Green Sea Turtles nest on the back beach area, so it was off limits. There were various types of tropical fish such as Yellow tailed Surgeon Fish, Parrot Fish, and the small Galapagos Damsel Fish. We spent about 2 hours at the beach before returning the ship for lunch. 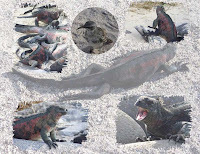 View our Galapagos - Bachas Beach photo album. All of Day 5 (Tuesday, Sept. 2nd) was spent on Floreana Island. Our afternoon activity was a Zodiac ride, wet landing and hike to Baroness Lookout. In the 1930’s Floreana became a setting for intrigue and mystery. A German dentist and his mistress, a young family (the Wittmer family who still live on the island) and self proclaimed baroness with three men came to settle in the island. Shortly after the baroness and her lovers arrived chaos began. 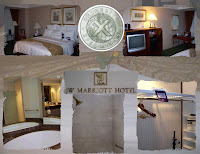 They terrorized the other inhabitants while planning to build a luxury hotel. Eventually, the baroness, her two lovers and the dentist all turned up missing or dead. There has been much investigation searching for what really happened on Floreana, but there have never been any hard answers. For this reason, Floreana is referred to as the “island of mystery”. The landing site in the afternoon was supposedly used by the baroness to spot ships that would come to visit these “eccentric” residents of Floreana. From there we had a hike to the lookout. Due to the wet landing, we had our Teva shoes on. We definitely suggest footwear such as that since the last portion of the hike is along a steep incline with stairs built into the path that are quite a distance apart. Make sure to bring your hiking stick with you for this activity. Once arriving at the lookout, we had a magnificent view of the surrounding area. There is a wooden platform at the top so you can rest a bit before returning to the Zodiacs. This was one of the more picturesque spots that we visited during our Galapagos journey. 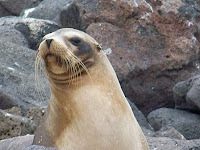 Be sure to visit Galapagos - Baroness Lookout and our other photo albums for more pictures. Floreana Island is the sixth-largest island in the archipelago and one of four that Charles Darwin visited while aboard the HMS Beagle. 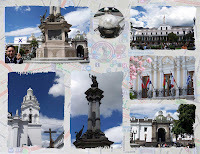 In 1832 Ecuador annexed the islands and established the first human settlement. It soon turned into a penal colony as many political and other prisoners were sent there. The island was the first capital of Galapagos during the 19th century. Day 5 begain with a wet landing on a beach that has a large amount of Olivine crystals that were part of the volcanic history of the site, known as Punta Cormorant (Cormorant Point). We placed our snorkeling gear on the beach and proceeded inland eventually arriving at a brackish pond where we observed pink flamingos. Sea Turtles nest on this island. We saw their tracks on the beach. Following our hike, we went snorkeling and swimming. Sea Lions played with us in the water making for an enjoyable morning in the water. After two hours we returned to the ship. Those that wanted to do an advanced snorkel left for Champion Island where they were able to snorkel with Sea Lions, Spotted Eagle Rays, and Green Sea Turtles. In my next post, we'll continue with the afternoon activities. 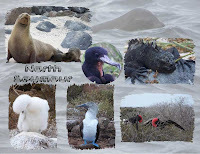 Before continuing our journey, view our Galapagos - Cormorant Point album. Our afternoon activity was scheduled to be a dry landing at Punta Suárez, or Suárez Point, which is located on Española, the oldest Galapagos island. 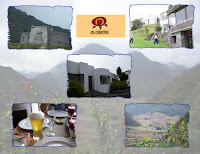 It has a high concentration of wildlife. As our Zodiac approached our dry landing site, the waves started to roll in, preventing us from landing. One Zodiac had successfully made a landing before the waves started crashing in. The Naturalists always take safety into consideration and decided to wait for the waves to subside before attempting the landing. We made several attempts to land at the original point, but then changed to an alternate rocky spot which was away from the waves. Several people got off the Zodiac at this alternate location. There were a few people, myself included, that were leary about exiting on the volcanic rocks and stayed onboard the Zodiac. We made a final attempt at the original spot and then returned to the alternate location to let anyone that still wanted to do the dry landing to exit the Zodiac. 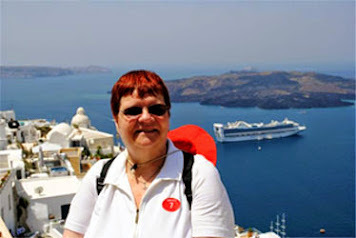 My husband got off, but I stayed on the Zodiac and returned to the ship. Expect to observe sea lions, Galapagos hawks, Blue-footed and Masked Boobies, and Red Marine Iguanas, strange creatures found only on this island. In additon to the above, my husband saw Mocking Birds and a snake. As usual, he was able to get up close to the wildlife for plenty of photo opportunities. Because we had wasted so much time trying to land, the hike was shortened, but the overall experience was still satisfying. 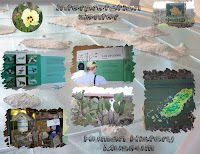 We are glad that the Naturalists are safety and conservation minded. 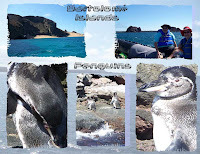 Check out our Galapagos - Española photo album for more pictures of this activity. 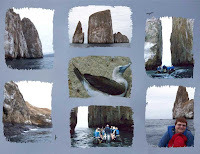 Monday (Day 4) morning was action packed starting with the 7 AM Circumnavigation of Kicker Rock, followed by breakfast, and then immediately followed by a Dry Landing at Puerto Baquerizo Moreno at 9 AM. Monday afternoon began with lunch in Darwin Restaruant upon return from our morning excursion. Following lunch, it was time to pickup snorkeling gear which would be used for the remainder of the cruise. 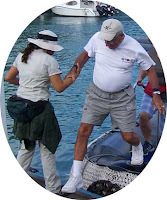 As you may have noticed, excursions thus far have consisted of dry landings and hikes or Zodiac rides around islands. Tuesday would be the first opportunity of several to snorkel. Celebrity Xpedition staff was on Deck 6 starting at 1:30 PM to assist the passengers in selecting their snorkeling gear. Each passenger selected their snorkeling equipment which included snorkeling mask, snorkel, fins, wet suit, mesh bag, and optionally a life vest. The naturalists were on hand to make sure the equipment fit properly. 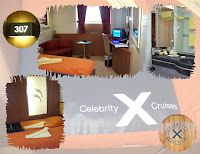 Even though we have our own snorkeling gear that we use on cruises, we opted to use the equipment provided by Celebrity Xpedition. Doing so kept our weight down for our baggage. The equipment was fine although by the end of the week, I did notice that my snorkel was showing signs of wear. You'll want to check your equipment carefully to be sure it is in working order. I'm assuming that they periodically replace defective equipment. After selecting our gear, we checked it out with one of the naturalists. You are responsible for the equipment from that point on. Everything goes into the mesh bag which comes in quite handy when disembarking the Zodiacs. Most snorkeling outings include a wet landing and hike around the island before swimming and snorkeling. 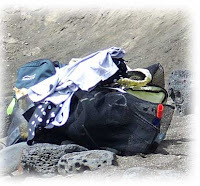 Once on shore, the bags are lined up and the hiking activity takes place. Following the hikes you get into your snorkeling gear and head for the water. The bags have plenty of room for storing cameras and other personal items that you don't want while snorkeling. Following a snorkeling activity, all equipment goes back into the mesh bag. Every attempt is made to keep sand off of the Xpedition, so the gear never goes beyond the aft deck. Once back onboard the ship, you remove your personal items from the mesh bag, take out the towels and wet suit and leave in the snorkel mask, fins, snorkel, and life vest. You then dunk the wet suits in sanitized water and return to a naturalist who hangs them up to dry. The mesh bags are also dunked and hung up. Each bag has the cabin number on them, so you simply pick up your bag the next snorkeling activity. The entire snorkeling operation is very organized. By the way, there is an orientation on Monday afternoon but it mainly is about how the snorkeling gear will be handled. The expectation is that you already know how to snorkel. So, if you've never snorkeled before, you might want to get some instruction prior to your cruise. We'll discuss snorkeling activities in detail in future posts. Snorkeling is an integral part of the Xpedition, so I suggest that you plan on attending the orientation and picking up your gear. After the visit to Kicker Rock, we set sail for the island of San Cristobal, arriving at approximately 9:00 AM. San Cristobal is the fifth largest and the easternmost island in the Galapagos Archipelago and one of the four islands that Charles Darwin visited aboard the HMS Beagle. 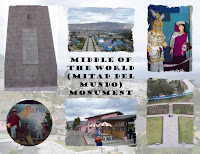 The morning activity for everyone consisted of a Dry Landing at Puerto Baquerizo Moreno to visit the Interpretation Center(Human History Museum) and walk through the town. The town is stretched out along a small harbor. On one side of the harbor is a military base and on the other side is the dock where we disembarked from the Zodiacs. We boarded a bus for a short ride to the Interpretation Center which is financed by the government of Spain. 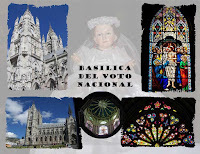 It offers a journey through the history of the isalnds form the context of man, nature, an d conservation. 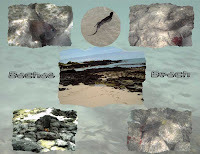 We learned about the characteristics of the natural areas and about the natural processes that have made Galapagos such a unique place in the world. Upon returning from the museum, we walked along the waterfront part down Charles Darwin Avenue. It is a cobbled street with benches and nice plantings along with a few shops. 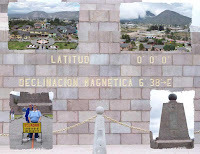 We spent about 2 hours in the town before returning to the Xpedition by Zodiac. 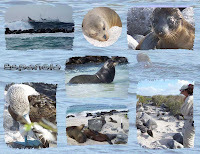 View our Galapagos - San Cristobal photos.